Did you ever want to boot an HyperV Windows VM from a USB key on a physical PC? Or simply want to boot windows from a USB key? Why would you want to do that you ask? Well, this can be really handy to run the new flavor of Windows you want without needing to mess with your PC internal HDD. It allow you to bring your own Windows environment in a classroom and boot to what you know every time and continue to work where you left things at. Since it also run from a fast USB 3 key it can actually be much faster than running windows on an old clunky 5400 rpm internal drive. Get a fast USB 3.0 key like the Sandisk Extreme USB 3.0 Flash Drive. Build yourself a Windows HyperV VM. Make sure the VM virtual HDD is smaller than the capacity of your USB key by 5 to 10 GB. This space will be used for the pagefile. Now that you have the required components connect your USB key to your PC. 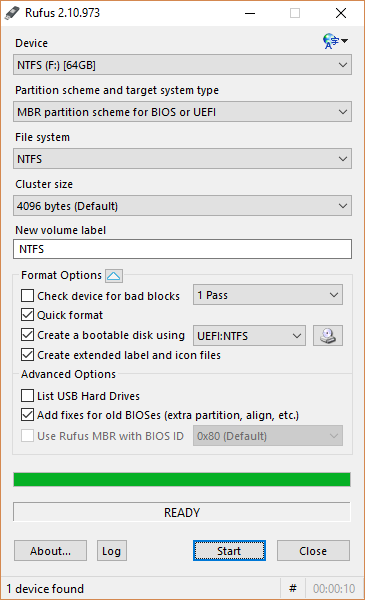 Next open Rufus, select the USB key under Device and configure it to use a Partition scheme and target of MBR partition scheme for BIOS or UEFI. Select NTFS as the File system. Keep the default Cluster size to 4096 bytes. Name the useb key (NTFS in the example below”. Click the white arrow beside “Format Options” to access the hidden options. Click Start. In a few seconds your USB key will be formatted and ready for the next step. Take note of the drive letter assigned to the USB key (f: in my case). Copy the VM folder at the root of your USB key. Next, open the VM folder on the USB key and then open the “Virtual Hard Disks” folder. Right click on the vhdx file an select mount. That is it. You should now have a fully bootable VM in a USB key. Bravo!